Are you an international student? 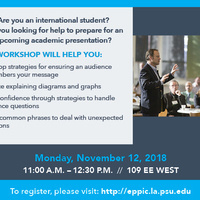 Are you looking for help to prepare for an upcoming academic presentation? To register for this workshop, please visit EPPIC at our website. An effective presentations and preparing the wonderful college based methods with us for clear delivery and ensuring questions. We can find here https://www.easy-essay.org/essay/ the workshop phrases and practicing the more diagrams always.